Tesla Model S, Model 3 and Model X owners as well other EV owners should always be alert and careful because, as is shown in this video, thieves can steal your Tesla in 10 seconds even if you are 10 feet away. If you read this story, please share it with Tesla or in Tesla forums. The company needs to know how easily thieves can steal Teslas so they can come up with protective technologies. Andrei Kondrashov from Kondrashov Lab demonstrates how vulnerable Tesla is to the following type of car theft. 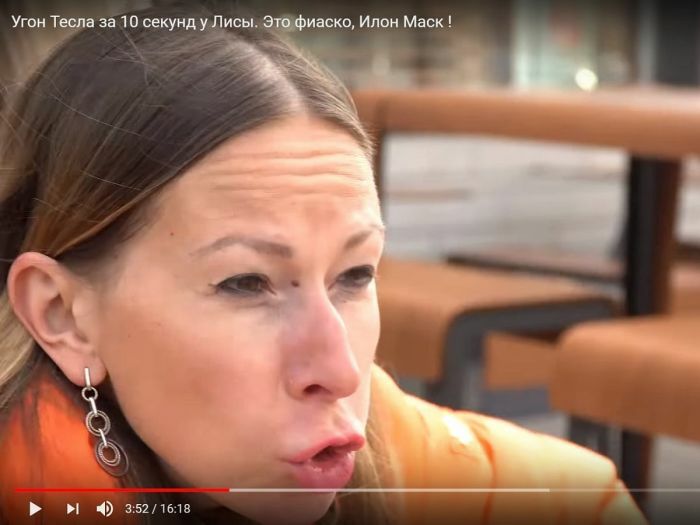 For the test, Kondrashov took the car from Elena Lisovskaya (a popular Car Youtuber from Lisa Rulit) and checked the vulnerability of the regular radio channel by re-transmitting the signal. The car-theft took no more than 10 seconds. The owner of the Tesla is in the video and she is participating in this test. The idea is to see if Tesla is vulnerable to car theft. The video is in Russian language, but my explanations here and the illustrations will demonstrate how vulnerable Teslas can be to this type of theft. I will also write what Tesla owners can potentially do: basically nothing, except being extra vigilant. The video warns not to try to reproduce this test. This is only for information purposes. Look at the picture below. The lady in the orange-colored jacket is the Tesla Model S owner who enters a cafe to get a cup of coffee. The girl with the black hand-bag that is walking behind the Tesla owner has a transmitter in her hand-bag. See in the image below. Then Elena, the Model S owner, goes to sit outside to enjoy her coffee and watch her car. You think no one can touch your car. But note that the lady with the black hand-bag keeps a close distance. See in the picture below. She keeps a close distance because she has a transmitter, which connects to the Tesla owner's car key and re-transmits the signal to the thief's device, which waits somewhere close the car. Now in the next picture you can see how the "thief" approaches the blue Tesla Model S to open the door and drive way while the owner in the in orange-colored jacked enjoys her coffee. The third lady in the picture is the girl with the black hand-bag re-transmitting the Tesla owner's car key signal to the "thief." You will have no idea that the girl next to you is re-transmitting your car key's signal. Here is the entire scheme. The "thief" approaches the car with a special tech device. The car asks for the key. Since the key is far away, the "thief" is using the re-transmitter and the re-transmitter gets the key's signal from the owner. This is why the girl with the black hand-bag keeps a close distance from the owner. As a result, the car will move and the thieves can register new keys. What's interesting is that other non-Tesla cars can be stolen in the same way as well, as Kandrashov explains in the video below. Watch for suspicious people who constantly keep a close distance within 6-10 feet from you and who may carry bags. I know, it's hard to always be that alert, but this is how thieves can steal your Tesla or another car with advanced technologies. Top image: This is how Elena reacted when she saw her Tesla Model S being stolen. You can also turn your Tesla's "passive entry" off. It will ignore the fob signals until you actually push the button on the fob. Tesla has an update for this. A while ago when they added the option to turn off "Passive Entry". This makes it so you have to push the button on the top of your fob twice instead of unlocking when you approach the vehicle. The car will ignore the signal that the fob puts out when the fob is 'idling' so while it can be spoofed, the car will ignore it anyway.